Maxi D3 1000™ is your logical source for supplemental vitamin D. It supports calcium absorption in the gut and the mineralization of bones. It also supports modulation of neuromuscular control and reduction of inflammation. Maxi D3 1000™ is made with 1000 IU's of vitamin D3, the most absorbable form of vitamin d. That’s why you want vitamin D3 preferred over vitamin D2. 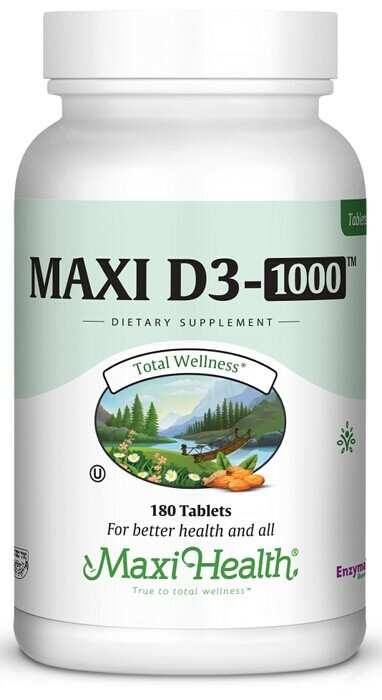 Try Maxi D3 1000™ to support your health. Take one (1) tablet daily with meals, or as directed by a healthcare professional. Other Ingredients: Dicalcium phosphate, microcrystalline cellulose, stearic acid, Enzymax® (calcium carbonate, bromelain, papain, lipase,amylase, protease, silica), magnesium stearate, croscarmellose sodium, aqueous film coating (purified water, hydroxypropyl methylcellulose, vegetable glycerin). After waking up with a terrible cold one day, I took Maxi D3-1000 and I started to get better. Since we started taking Maxi D3-1000 we have much less colds. We give our children the chewable version and they have less colds and ear infections! Thank you. Every day I use to wake up with a terrible headache. I just could not stand it. After seeing the nutritionist he told me to take Maxi Health D3. The difference is great. Thanks again. After taking my daughter to the doctor, tests showed that her vitamin D level was very very low. We started giving her Maxi D3 1000 and by the end of the month, her levels doubled which was normal for her. My doctor told me that I was low on vitamin D. I was relieved to find kosher ones available after almost buying the non Kosher ones from CVS.